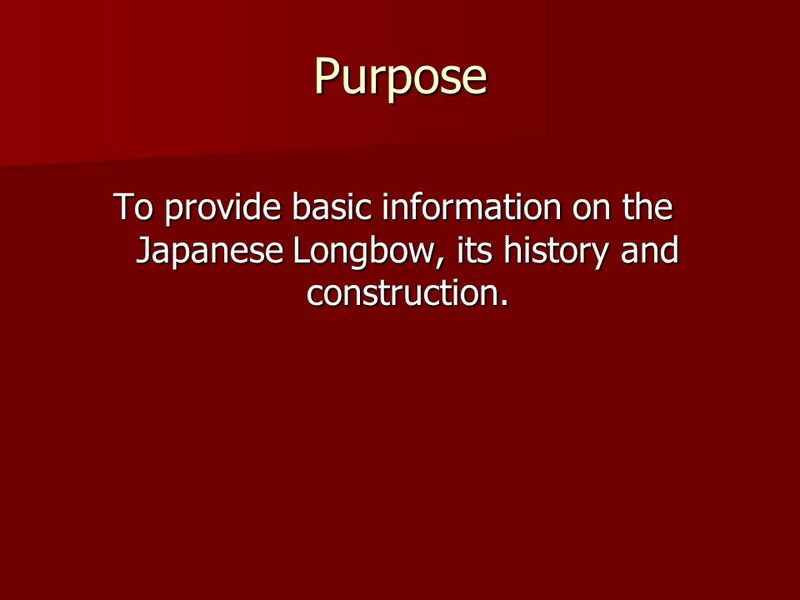 3 Purpose To provide basic information on the Japanese Longbow, its history and construction. 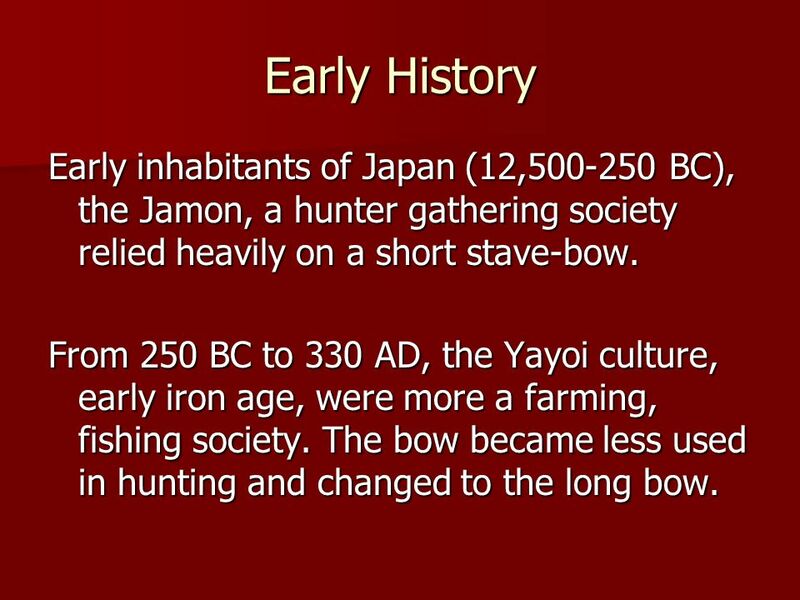 4 Early History Early inhabitants of Japan (12, BC), the Jamon, a hunter gathering society relied heavily on a short stave-bow. 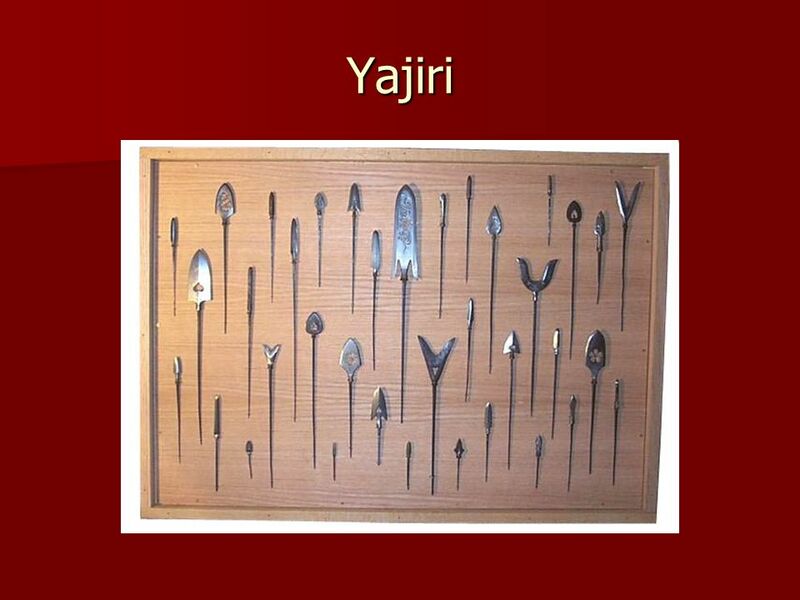 From 250 BC to 330 AD, the Yayoi culture, early iron age, were more a farming, fishing society. The bow became less used in hunting and changed to the long bow. 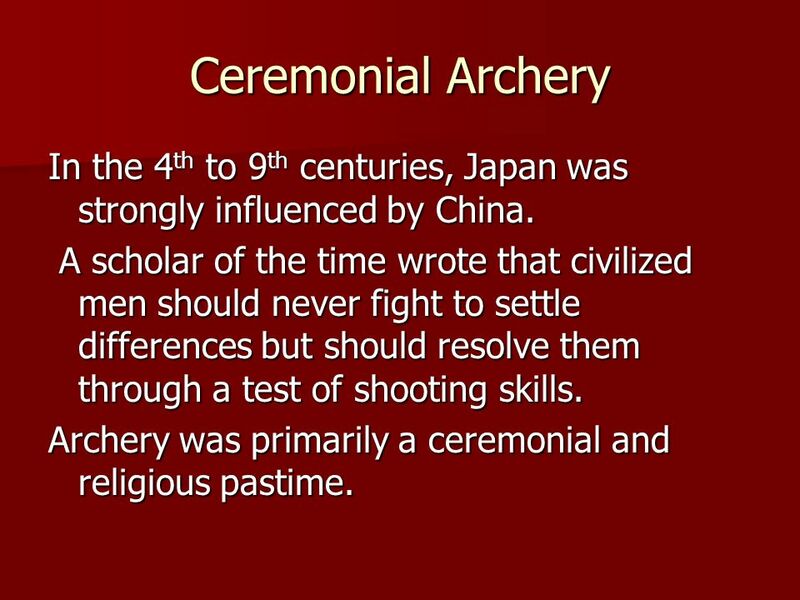 5 Ceremonial Archery In the 4th to 9th centuries, Japan was strongly influenced by China. A scholar of the time wrote that civilized men should never fight to settle differences but should resolve them through a test of shooting skills. Archery was primarily a ceremonial and religious pastime. 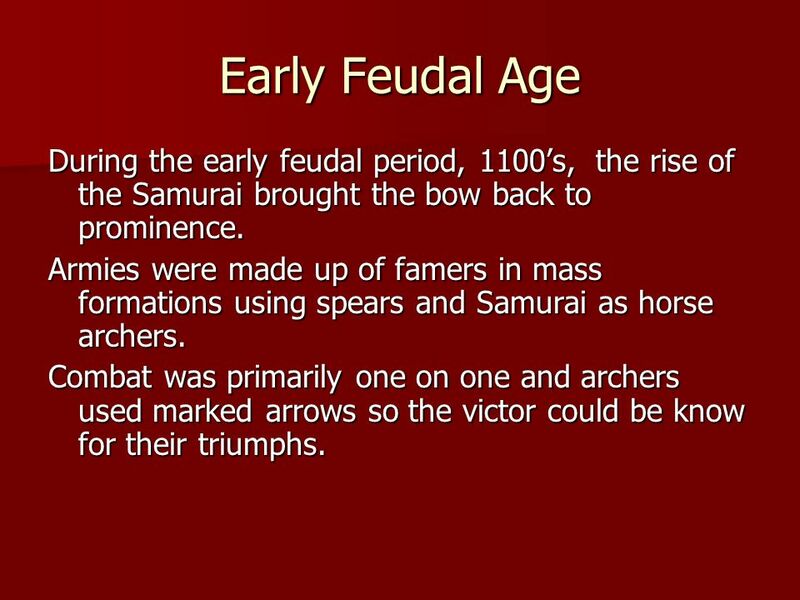 6 Early Feudal Age During the early feudal period, 1100’s, the rise of the Samurai brought the bow back to prominence. 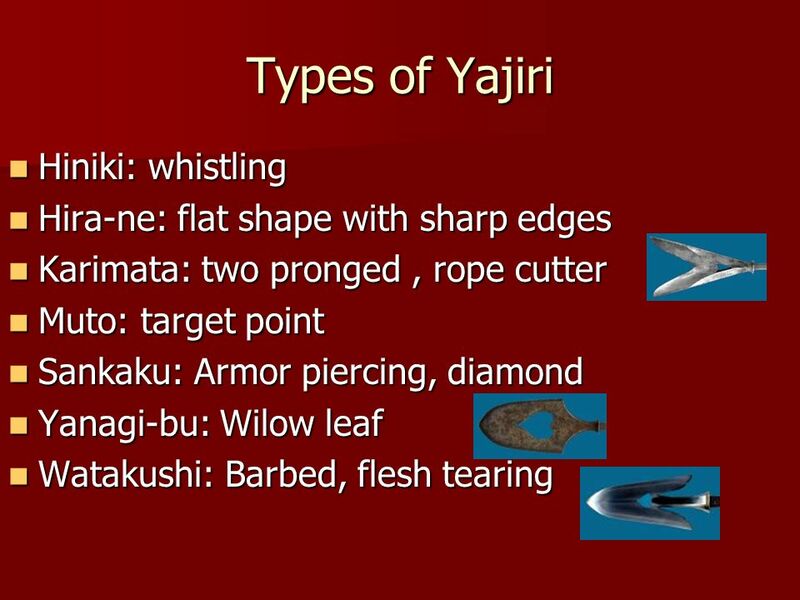 Armies were made up of famers in mass formations using spears and Samurai as horse archers. Combat was primarily one on one and archers used marked arrows so the victor could be know for their triumphs. 7 Peak During the 15th and 16th Centuries the bow reached its zenith. 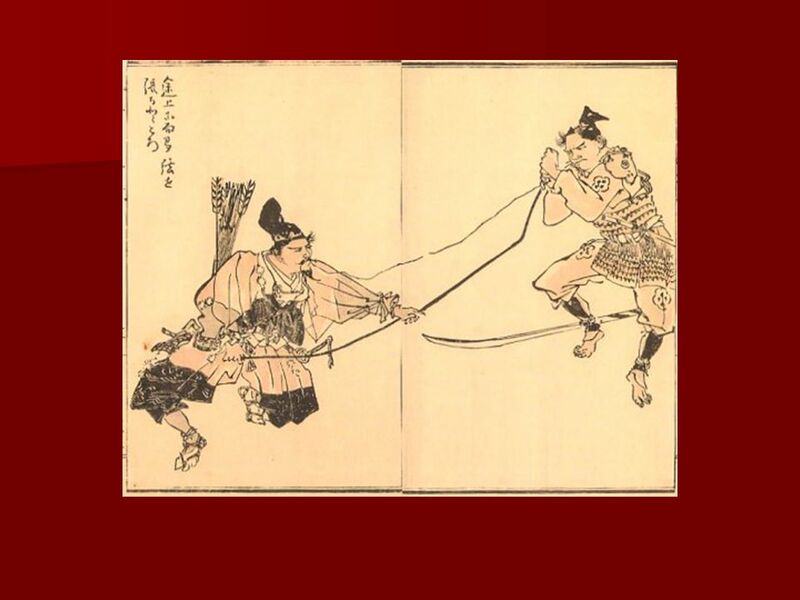 Armies consisted of trained warriors, Ashigaru, using spears and bows. The Bowmen would have been used for mass formation shooting to rain arrows on the enemy. 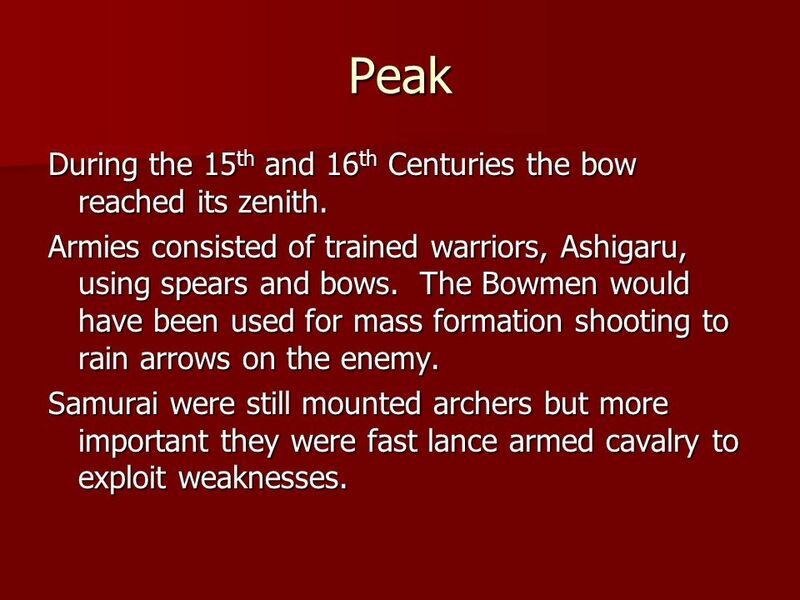 Samurai were still mounted archers but more important they were fast lance armed cavalry to exploit weaknesses. 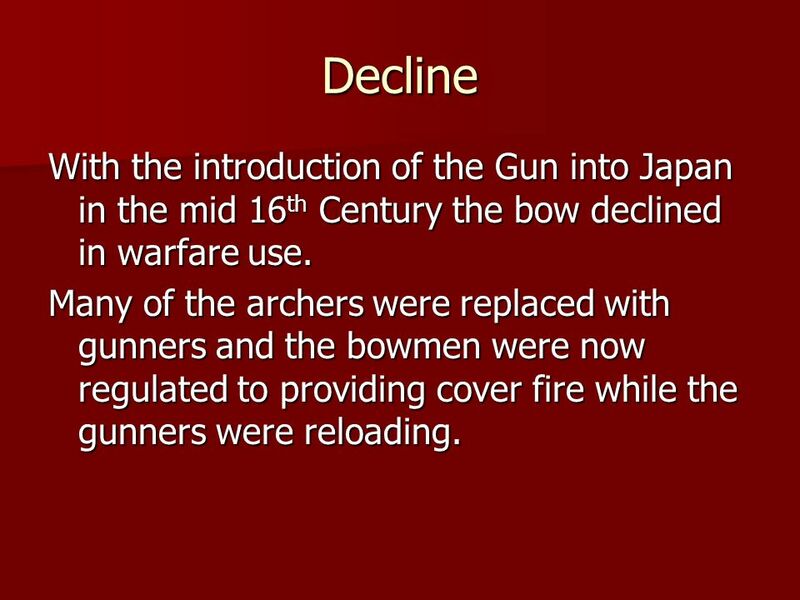 8 Decline With the introduction of the Gun into Japan in the mid 16th Century the bow declined in warfare use. Many of the archers were replaced with gunners and the bowmen were now regulated to providing cover fire while the gunners were reloading. 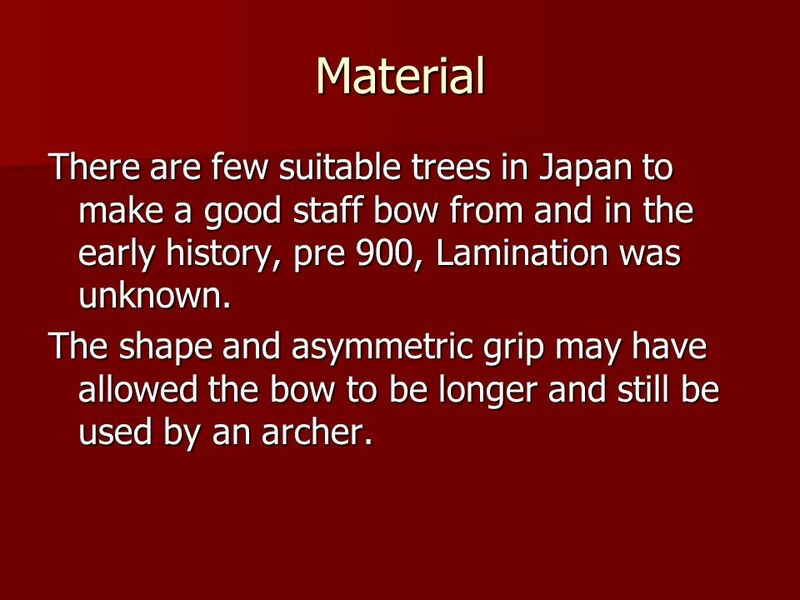 11 Material There are few suitable trees in Japan to make a good staff bow from and in the early history, pre 900, Lamination was unknown. The shape and asymmetric grip may have allowed the bow to be longer and still be used by an archer. 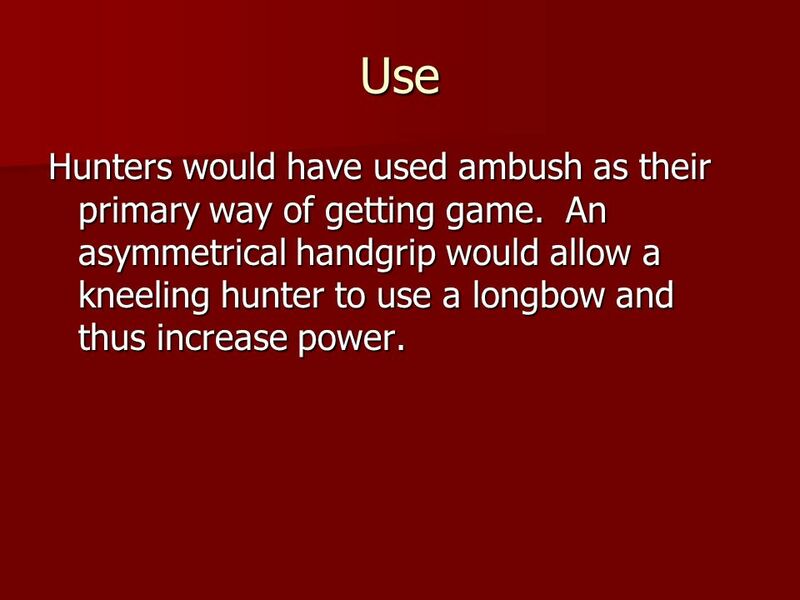 12 Use Hunters would have used ambush as their primary way of getting game. An asymmetrical handgrip would allow a kneeling hunter to use a longbow and thus increase power. 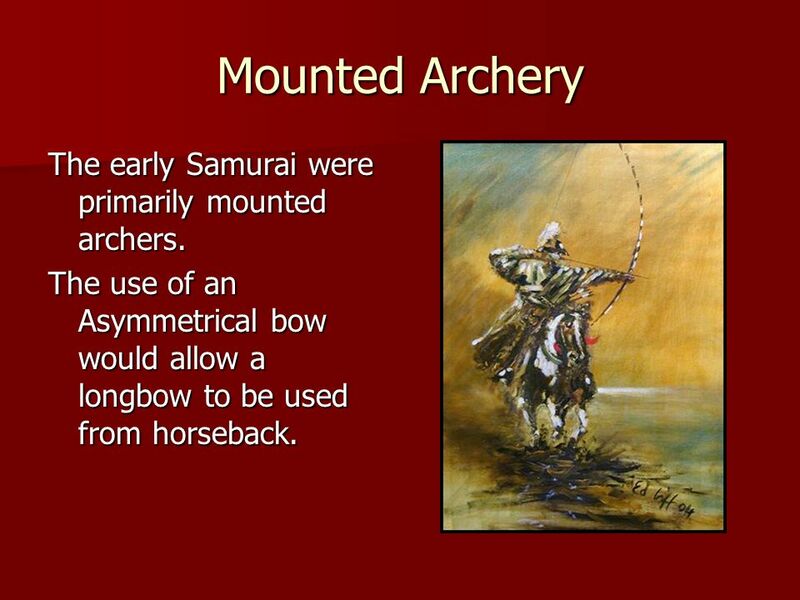 13 Mounted Archery The early Samurai were primarily mounted archers. 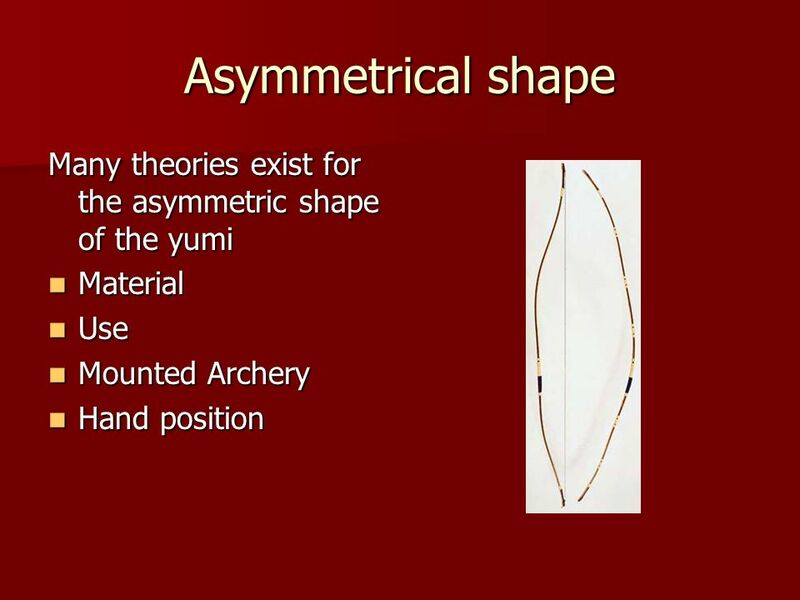 The use of an Asymmetrical bow would allow a longbow to be used from horseback. 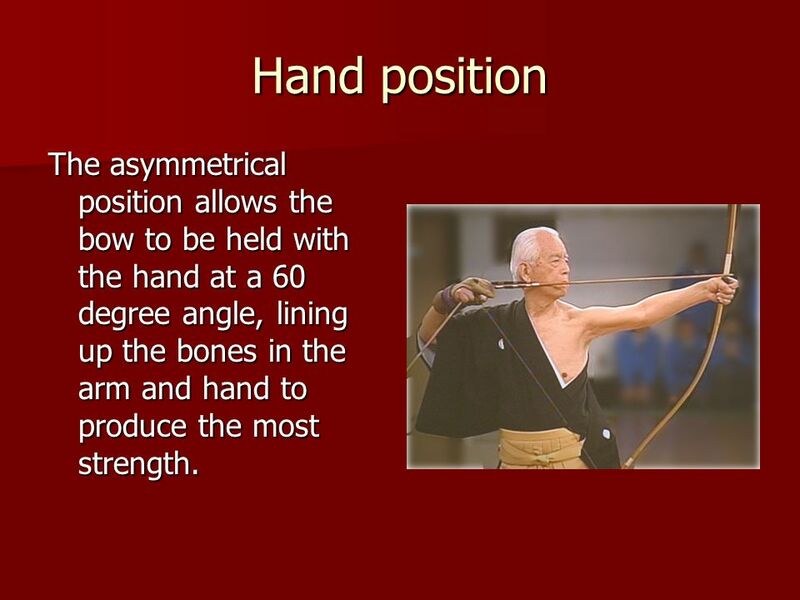 14 Hand position The asymmetrical position allows the bow to be held with the hand at a 60 degree angle, lining up the bones in the arm and hand to produce the most strength. 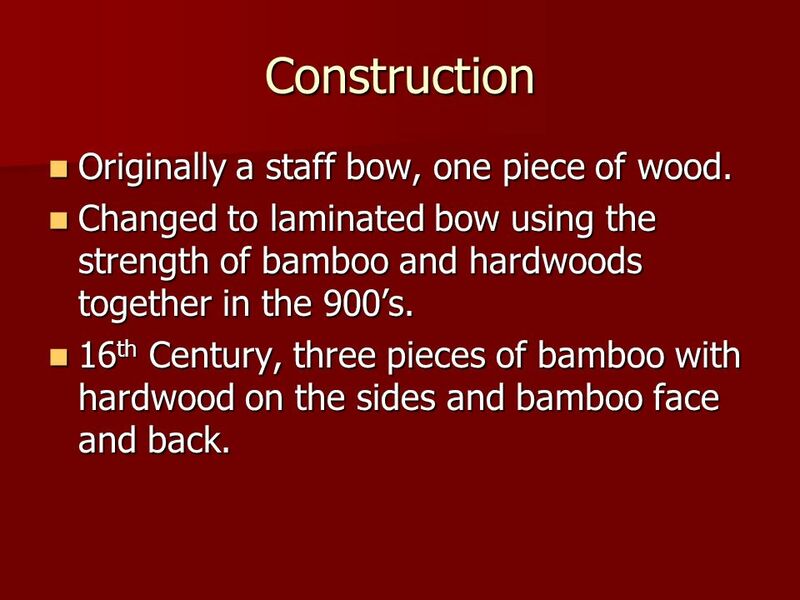 15 Construction Originally a staff bow, one piece of wood. 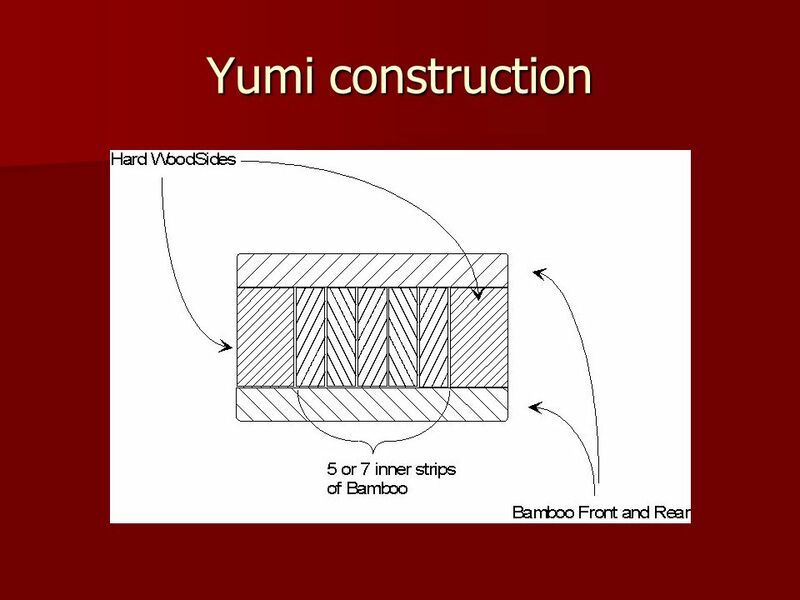 Changed to laminated bow using the strength of bamboo and hardwoods together in the 900’s. 16th Century, three pieces of bamboo with hardwood on the sides and bamboo face and back. 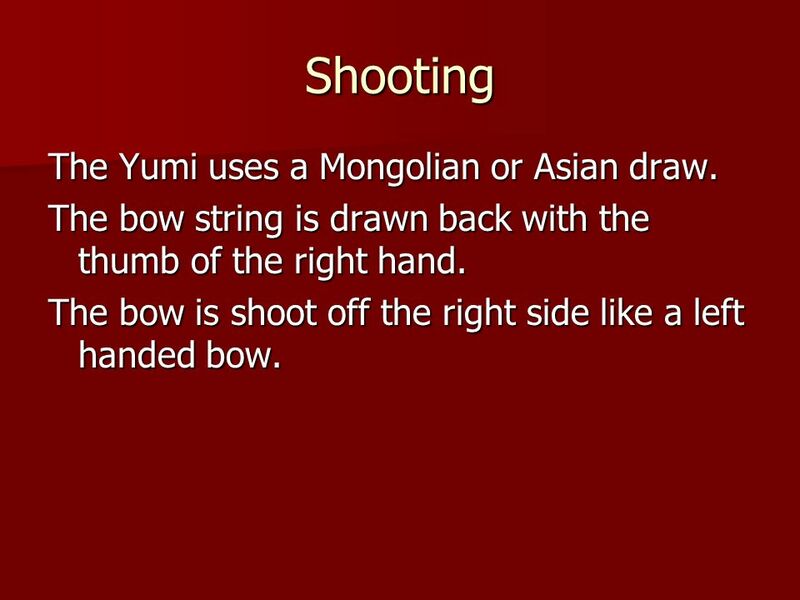 17 Shooting The Yumi uses a Mongolian or Asian draw. The bow string is drawn back with the thumb of the right hand. The bow is shoot off the right side like a left handed bow. 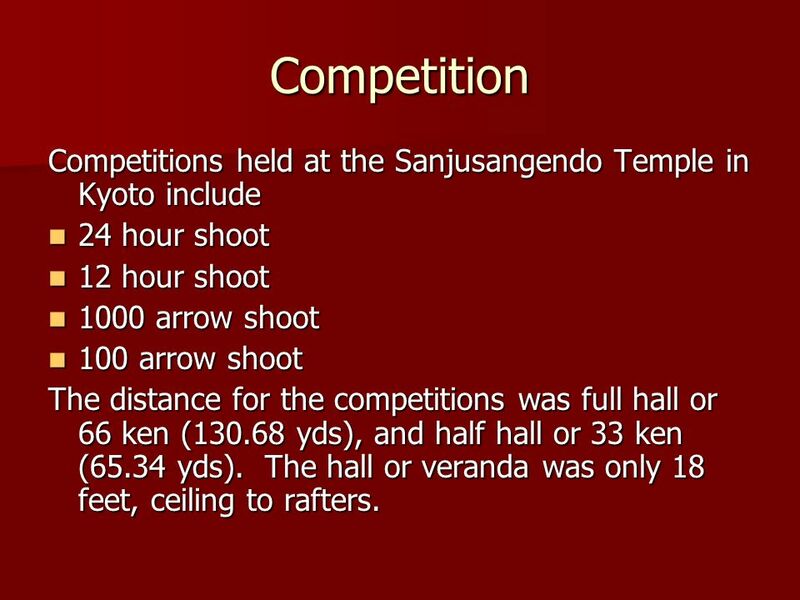 18 Competition Competitions held at the Sanjusangendo Temple in Kyoto include 24 hour shoot 12 hour shoot 1000 arrow shoot 100 arrow shoot The distance for the competitions was full hall or 66 ken ( yds), and half hall or 33 ken (65.34 yds). The hall or veranda was only 18 feet, ceiling to rafters. 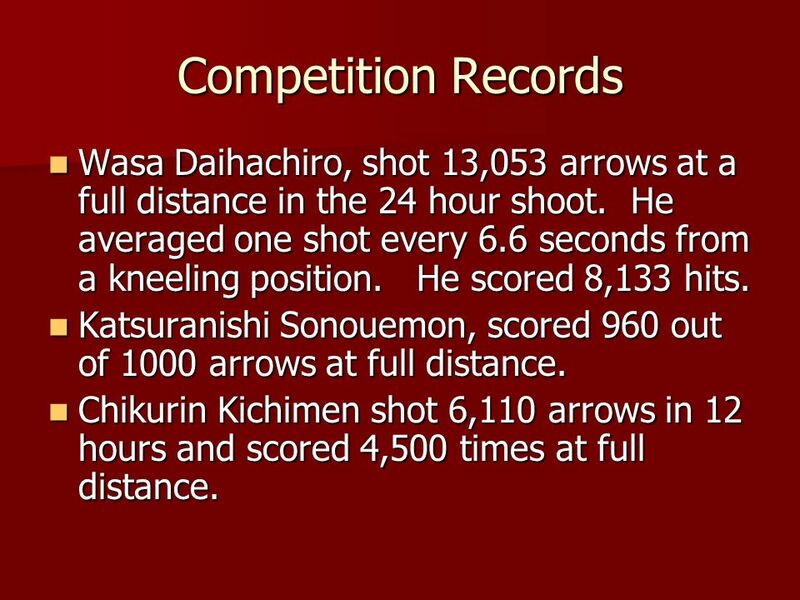 19 Competition Records Wasa Daihachiro, shot 13,053 arrows at a full distance in the 24 hour shoot. He averaged one shot every 6.6 seconds from a kneeling position. He scored 8,133 hits. Katsuranishi Sonouemon, scored 960 out of 1000 arrows at full distance. Chikurin Kichimen shot 6,110 arrows in 12 hours and scored 4,500 times at full distance. 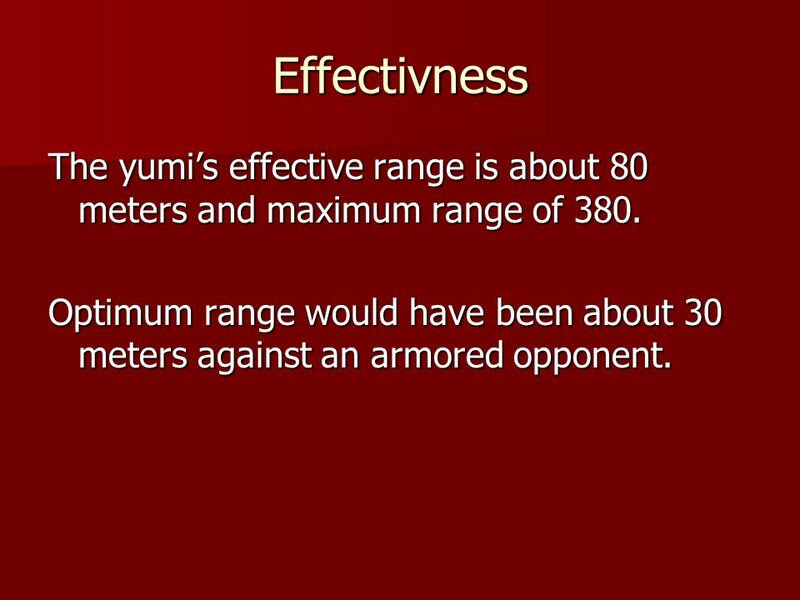 20 Effectivness The yumi’s effective range is about 80 meters and maximum range of 380. Optimum range would have been about 30 meters against an armored opponent. 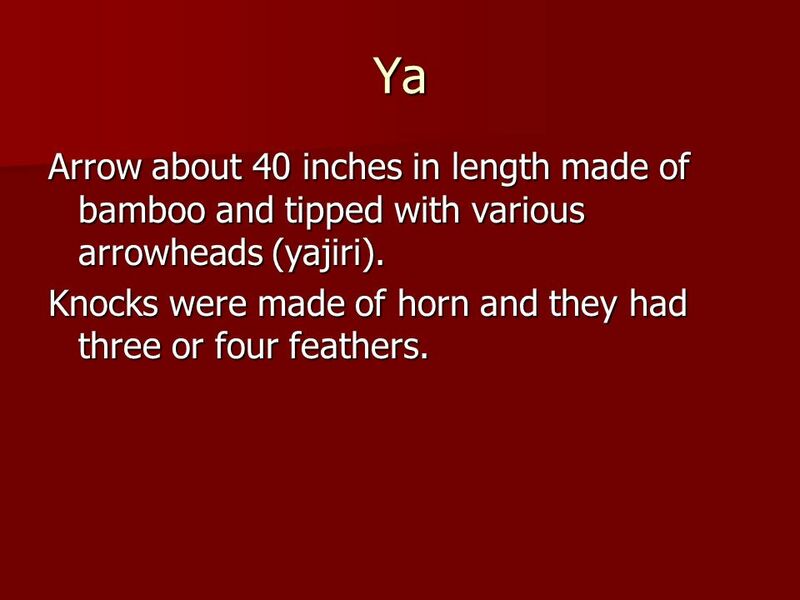 21 Ya Arrow about 40 inches in length made of bamboo and tipped with various arrowheads (yajiri). Knocks were made of horn and they had three or four feathers. 24 Kyudo Kyudo, the way of the bow, is still practiced today. 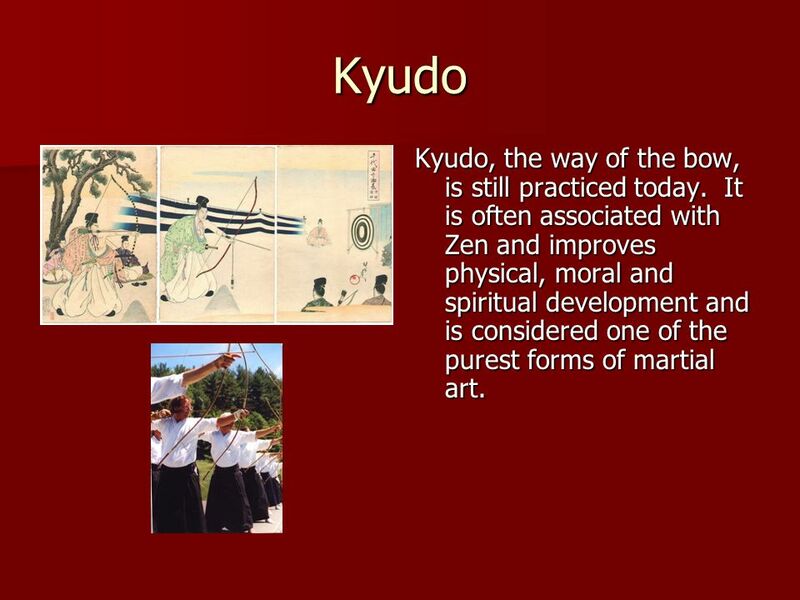 It is often associated with Zen and improves physical, moral and spiritual development and is considered one of the purest forms of martial art. 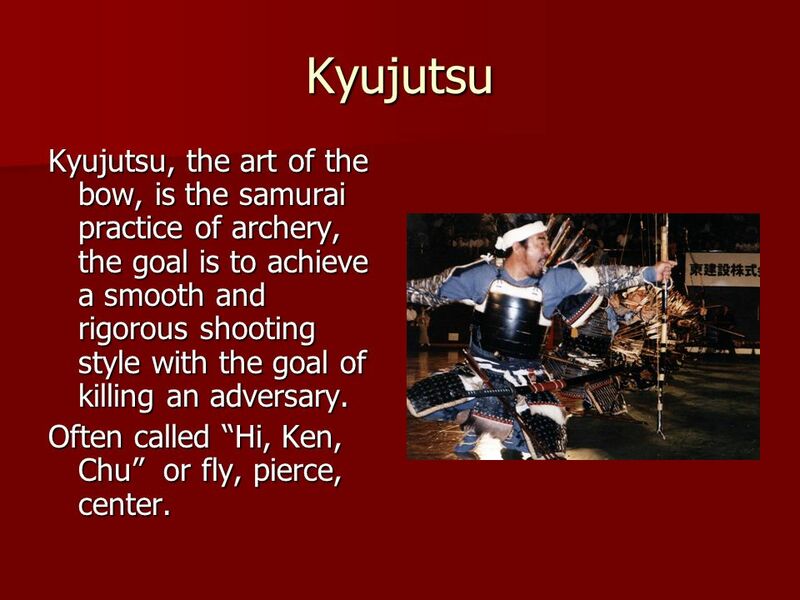 25 Kyujutsu Kyujutsu, the art of the bow, is the samurai practice of archery, the goal is to achieve a smooth and rigorous shooting style with the goal of killing an adversary. Often called “Hi, Ken, Chu” or fly, pierce, center. 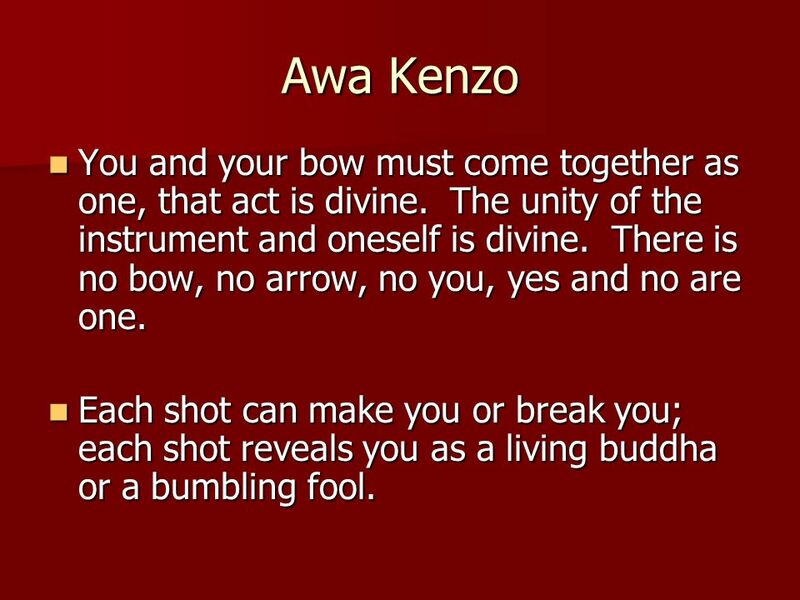 26 Awa Kenzo You and your bow must come together as one, that act is divine. The unity of the instrument and oneself is divine. There is no bow, no arrow, no you, yes and no are one. Each shot can make you or break you; each shot reveals you as a living buddha or a bumbling fool. 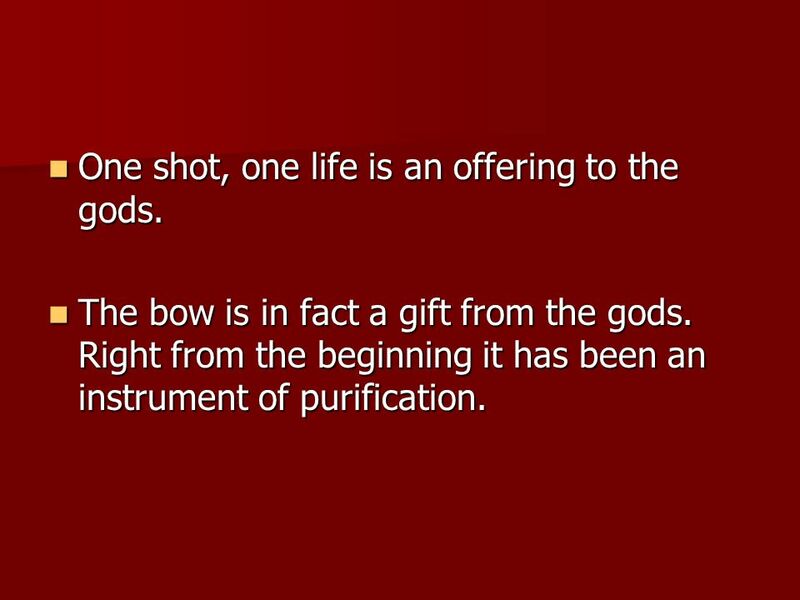 27 One shot, one life is an offering to the gods. The bow is in fact a gift from the gods. Right from the beginning it has been an instrument of purification. 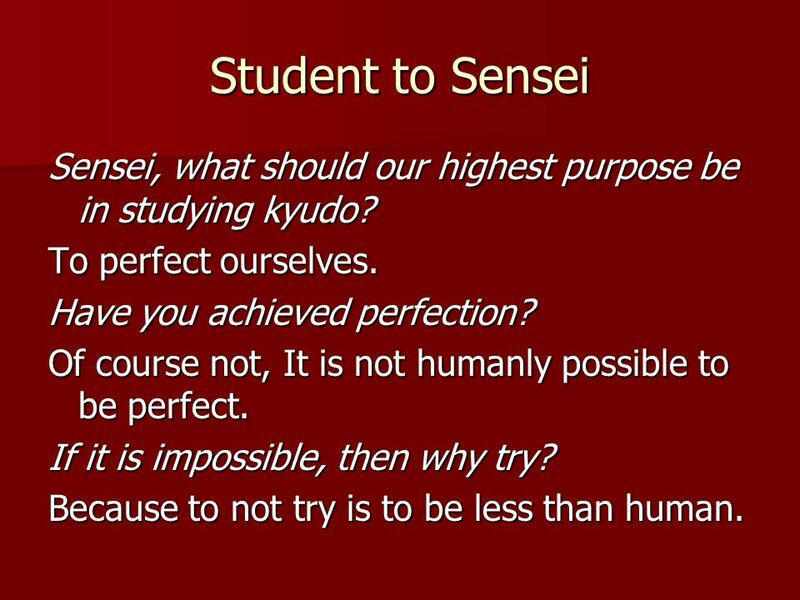 28 Student to Sensei Sensei, what should our highest purpose be in studying kyudo? To perfect ourselves. Have you achieved perfection? Of course not, It is not humanly possible to be perfect. If it is impossible, then why try? Because to not try is to be less than human. 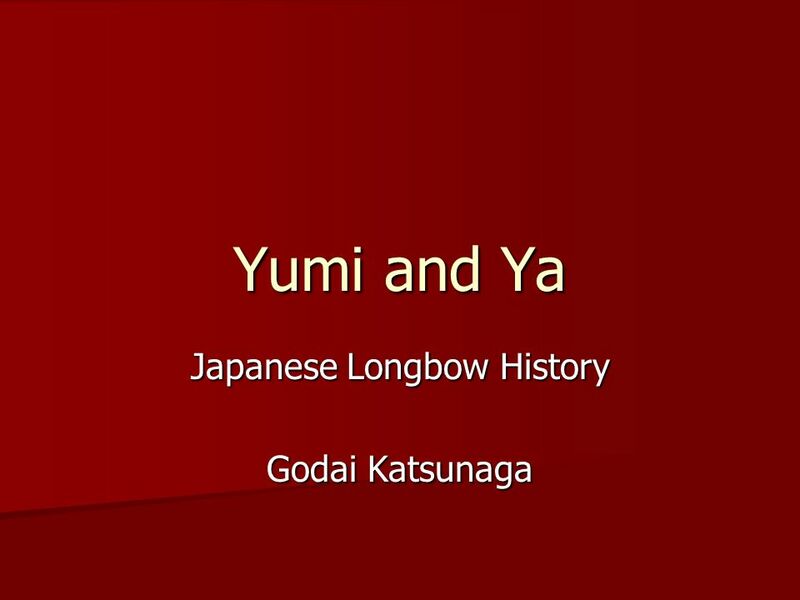 Download ppt "Japanese Longbow History Godai Katsunaga"
Border Longbows Border offers eight bow models many with advanced reflex / deflex designs and three models with fully traditional reflexed designs. All. GOLF GOLF Core 9 PE. Goal of Golf Goal of Golf To complete the set number of holes with the least amount of strokes as possible. To complete the set number. Section 2 Native Americans The Native Americans are obviously very important to this topic as they were the native people. There other names include American. Hoplite Warfare Heavily armored infantryman Hoplon Citizen soldiers Equipment was half the body weight. ARCHERY. 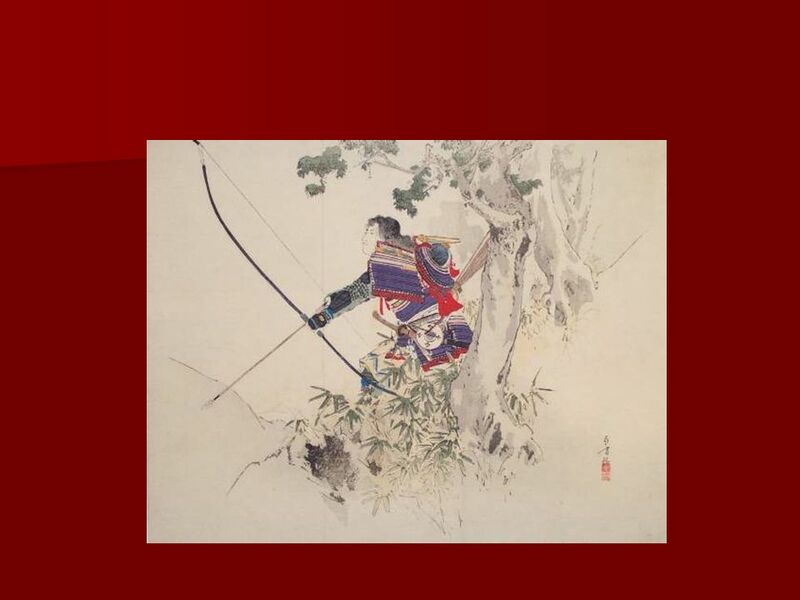 History of Archery Archery began thousands of years ago. In addition to gathering roots, leaves and nuts, humans desired to included wild game. By: James Starke & Josh Bricker September 2, 2009. By Edward  Armor looks like scales of fish  Used both shields and spears  Equipped swords for their sub- weapon Pilium. Elizabethan Era Hunting and Weapons. By: Chris McCarter. This weapon was made out of wood and metal and one blow from knocked most people off their horses hurting them.